Take Brasil. Add Filipinas. 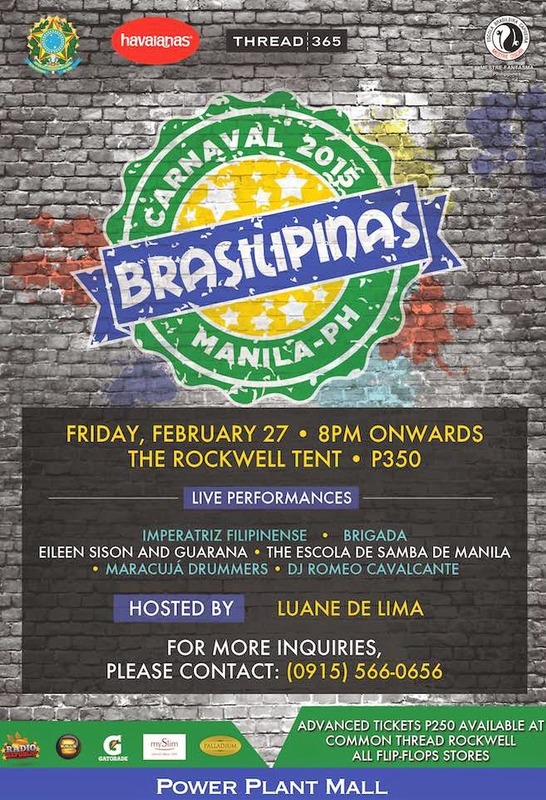 Travel to South America and revel in the streets as we recreate Latin American giant Brasil’s famous party here at home, the annual BRASILIPINAS Carnaval at the Rockwell Tent on February 27, 2015 (Friday) at 8pm onwards. Get your advanced tickets for PHP 250 available at ALL FLIP-FLOPS stores, COMMON THREAD Rockwell, or at the door PHP 350. This event is co-presented together by Powerplant Mall, The Embassy of Brazil in Manila, Havaianas, Thread 365, Aruga Rockwell Land, Gatorade, Balls, and My Slim. Free tickets and BRASILIPINAS prizes are up for grabs! 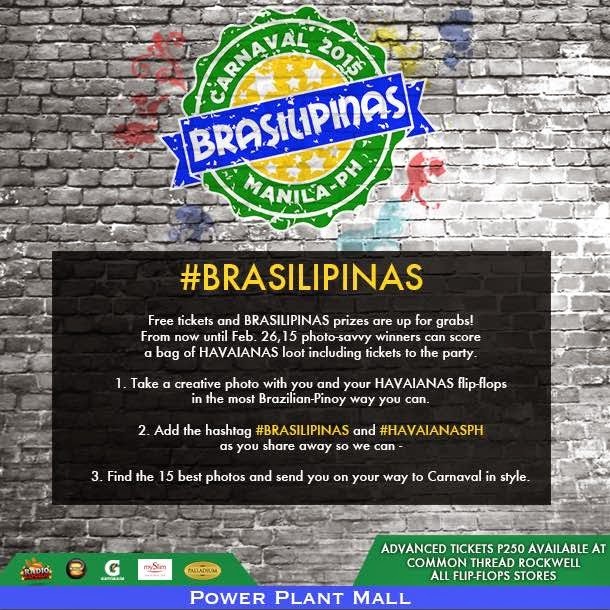 From now until February 26, 15 photo-savvy winners can score a bag of BRASILIPINAS loot including tickets to the party. Take a creative photo of HAVAIANAS flip-flops in the most Brazilian-Pinoy way you can. Add the hashtag #BRASILIPINAS and #HAVAIANASPH as you share away so we can find the 15 best photos and send you on your way to Carnaval in style. Born from Escola Brasileira de Capoeira’s efforts to spread its love of Brazil and martial arts, the BRASILIPINAS community has grown to encompass various events, most notably our annual Carnaval. In 2015 we follow up on the success of GOL (a world-cup viewing party during July 2014) with our 8th annual party at the Rockwell Tent named MADE IN BRAZIL. Recreating the street celebration with music, celebration, martial arts, cuisine, and authentic revelry found in an inviting atmosphere, experience Rio, Salvador, or São Paulo without even having to board a plane. Guests now come from all continents and countries such as Portugal, Macau, USA, Israel, France, Singapore, Malaysia, Indonesia, Taiwan, Australia, Canada, Hong Kong, and of course, Brazil. The party alone averages an attendance of 2,500-3,000 people a night.